There are a number of collectible products on the market these days and one that I have recently reviewed is bound to be something that you have probably either been asked for or will be asked for by your little Disney and Emoji fans. That is right, there are Disney Emoji collectible characters available and they are absolutely adorable. Disney Emjois came to the forefront with the release of the Disney Emoji movie. There are regular Disney Emoji collectible characters as well as the highly sought after golden Disney Emoji character collectibles. You can see in our collection above that we have 4 golden Disney Emoji characters. There are also the squishi Disney Emojis and in our collection, we have two Tinkerbell Squishis. Collect, emote and display your mini Disney Emojis! 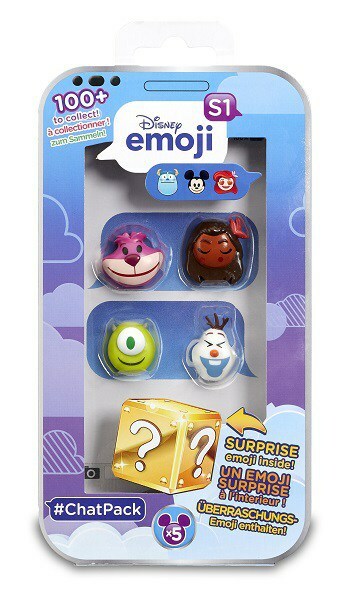 Make your own conversations and “As Told by Emoji” stories with these awesome stackable #ChatBubble containers and Disney Emoji figures! With over 100 characters to collect in Series 1, look out for the #Squishi & #Goldi specials! #ChatBubble includes 1 container, 2 Disney Emoji characters and a collector file. Collect characters from Disney Classic, Disney Princess, Pixar or Frozen and play out your own conversations with your Disney emojis. #ChatPack includes 4 characters, plus 1 hidden surprise character and a collector file. #GroupChat includes 8 characters, plus 2 hidden surprise characters and a collector file. In the picture above that shows my Little One’s collection of Disney Emojis, her collection was comprised of three Chatbubbles, one Chatpack, and one Chatgroup. Out of those items, she received only one double (Squishi Tinkerbell) and four Goldi specials. With each Chatbubble, you receive a plastic chatbubble and the images are different in them unless of course, you receive a double. The Chatbubble acts as a display case for your Disney Emoji characters. 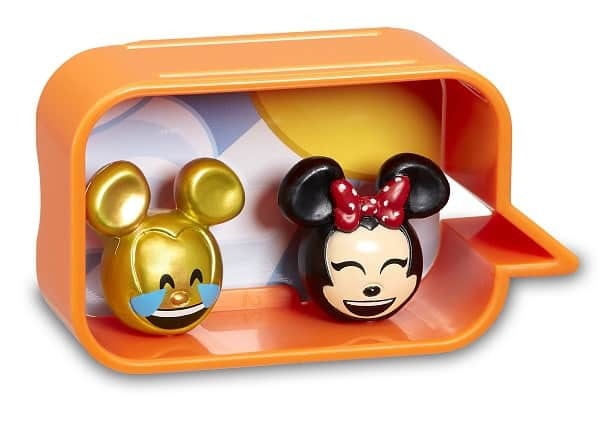 I have found that the price of the Disney Emoji collectibles is in line with other collectible products of the same nature. They seem to range from approximately $3.49 to $14.99 depending on whether you are looking at a Chatbubble or the large Chatgroup packs. The Disney Emoji characters are small and do provide a choking hazard so keep that in mind when purchasing them for younger children. 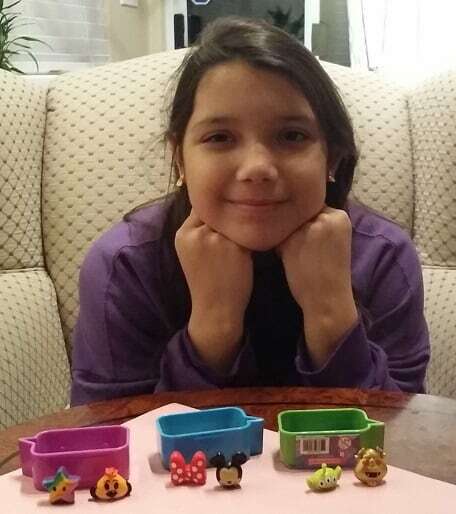 Other than the choking hazard, the Disney Emoji products will be loved by Disney and Emoji fans of all ages. 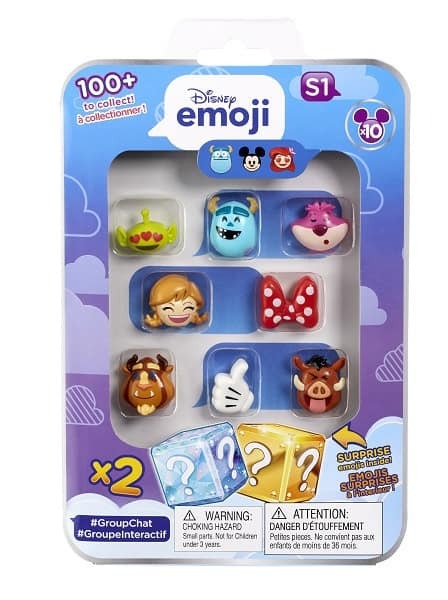 I am sure that we will soon see Disney Emjoi trading events appear at local stores that carry the Disney Emoji products; Toys R US, Indigo, and Walmart. I have not been able to find the products online at the time of this review at the official Disney Emoji stores, but I anticipate that they will appear in the next few weeks. They are available in stores though. 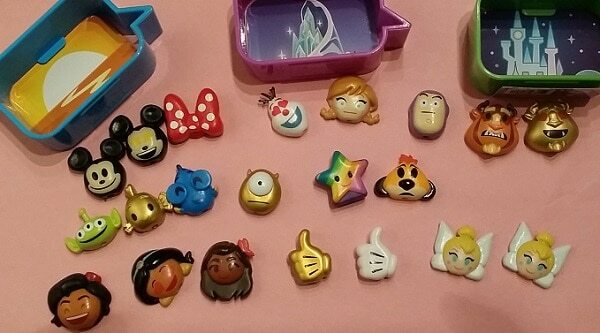 The Disney Emoji Series 1 was released in October 2017 so they are very new in the collectible market. To find out more about the Disney Emoji products, check out more here….